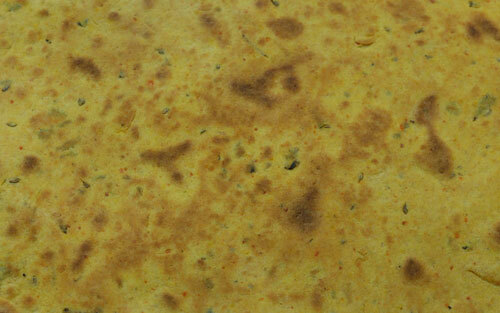 Khakhra is one of the popular vegetarian roasted thin cracker bread or snack from the Gujarati cuisine. Khakhra is a common Gujarati Indian bread or snack item served during breakfast or snack time. Khakhra is simple to prepare and is made from whole wheat flour adding other ingredients and spices. 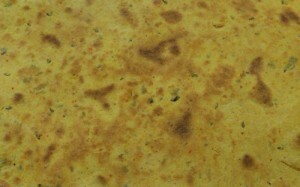 Khakhra is a crispy chapattior roti. There are several varieties of Khakhra like the methi, jeera, bajri, garlic, math and masala flavors. Khakhra is usually eaten with chutney, pickles, ghee or yoghurt. The Khakhra is a favorite ethnic food of the vegetarian Gujarati people and popular in north western India region too. It is a good non-fried item and can also be made with or without oil. In the state of Gujarat there are a number of commercial manufacturers or small scale industries catering to a variety of Khakhra and being sold to other states of India. The Khakhra is more like a readymade roasted papad. They are also tailor- made range according to the taste of the customers and also for diabetic patients preparing the karela khakhra or methi khakhra and many more. It’s a very crispy, crunchy, mouth watering tasty nutritious and a light snack. Easy to carry and most of the people of Gujarat carry these as snack during train travel. As preparing of Khakhra is very simple, I would always recommend all to prepare fresh Khakhra coz they would be more hygienic and nutritious. To prepare the Khakhra, take a bowl add whole wheat flour, little salt as per taste, chilli powder, ajwain (bishop’s weed or carom seed), kasuri methi (dried methi leaves), turmeric, oil and mix well to form a medium stiff dough. Rest it aside for 20 mins. Now divide the dough into equal parts of small roundels and make a phulka or chapatti size that has to be thin as a paper. Take a tava cook the paper thin roti on both side, keep pressing the roti with a cloth to make it crispy and flaky papad like till they turn slightly golden brown color. You can add oil on both sides while cooking if required or else you can even dry roast the roti. It was a thrill while I was making the Khakhra after a very long time and they turned really crisp. I wish you all also watch the video of making the crispy Khakhra and enjoy cooking. They are also a few sects of people who mix mat bean or moth bean or matki flour with wheat flour in preparing the Khakhra to make it more nutritious and healthy. Matki is very popular in Maharastrian cuisine. The beans are soaked overnight to make them sprout. These sprouted beans are used for Salad, Misal or Usal. There are a variety of flavors available in super malls but homemade Khakhra with less fat or without fat makes a tasty low calorie snack. The fenugreek herb is a great taste enhancer and adds flavor and texture to the Khakra and also if added to any vegetables, pulses and lentils, paratha and chapattis. The same time Ajwain is also a very beneficial herb used the culinary process as spice to few dishes. Ajwain acts as good appetizer, laxative and stomachic. It is used as effective remedy in managing ailments like vomiting, mouth diseases, pile, abdominal tumor, abdominal pain etc . Ajwain is very useful in alleviating spasmodic pains of the stomach and intestines, in adults as well as children. If you are on a long distance travel by train with any Gujarati co-passenger its unlike that you’ve not eaten Khakhra. It’s a savior for all long travel people as its shelf life is almost 1 month if stored well. Most of the vegetarian going abroad carry Khakhra to happily survive for few days. Take a bowl add atta, salt, chilli powder, ajwain, methi, turmuric, oil mix well. Now add water to make a dough medium stiff. Keep it a side for 10min. Now divide the dough into equal parts and make a pulka size roti but paper thin. Take a tava cook the paper thin roti both the sides keep pressing with a cloth to make a crsip and flackey papad cook both the side till slight golden brown colour. If required can add oil or ghee while cooking.